He was the object of the game this time. He'd bought his retirement from it with blackmail, blackmail that'd expired. Now he was in Chicago, walking out of an alley. He heard a car revving, and then gunfire rak-kak-kaaking at him. He ducked and ran- another Button Man came up behind him.
" Hate to shoot a man in the back, Harry! Turn around! " His second retirement was less bloody than his first- he bought it with blackmail, not death. He left the world of rich men that bankrolled death fights for the woods. There, he had his dog, wild prey to hunt.. and memories. His inviters were finding fault with him, because of how violently he was winning his fights. He had things going on inside him, things his handler Cora couldn't see. One night, he was woken from them by the barking of a wild dog. He'd killed his Voice to make it definite. He'd staggered away from the scene bleeding out and collapsed. He'd been found and taken to a hospital. Then he'd been taken again. It wasn't the killing for a Voice that bothered him. It was the killing for a Voice he didn't even know. His friend and fellow Button Man Carl knew his own Voice, thanks to fingerprints and police databases- he didn't act on that knowledge, though, because the Voices were too powerful to make that worthwhile. In confessing his Button Man life to a psychiatrist, Harry said what he knew about his Voice. He hadn't been a button man before that, though. He told this to a psychiatrist whose door he'd knocked on. Bandaging up his bleeding hand, he started his story with " I can't stop killing, doc. " This is sort of cheating the theme a bit - the Ventriloquist isn't really my favorite comic-book villain today, but he was the first one I ever developed an obsession with, so I thought it fitting to pay a small tribute to him today. Here are some pages from old Arnold Wesker's debut story, courtesy of John Wagner and Alan Grant (the two-part storyline was in fact their very first Batman story, which is quite impressive; not many writers create an instantly memorable villain on their first try). Even now, rereading it gives me a surreal sense of vertigo. It's not easy to believe that such a silly-seeming villain had so much violence surrounding him. Following on from my "America" post, some scans from the two sequels. "Fading of the Light" was published six years after the original story, and "Cadet" a decade after that. (Since the Dreddverse runs in more or less 1:1 time, the same amount of time passes in-universe between the stories.) 12 pages of scans beneath the cut. Warnings: References to sexual assault and a euthanasia plotline. Next up: Beeny's part in the Tour of Duty saga. Warnings: Graphic violence; dark themes including abuse of power by the authorities, forced abortion, and some creepy violating use of future medical technology. There were two sequels to the story published later, covered in my next post. Part two of my series of posts on Judge Dredd and his clones. (Part one is here.) These scans are all from the Brothers of the Blood TPB collection, a series of stories that follow the formation of Dredd's unlikely little family unit. About 18 pages of scans beneath the cut. In part three: another clone, ups and downs in Dredd's relationship with his niece, and some gloriously awkward family Christmases. Been collecting scans for this for a while, but the reappearance of a certain character in this week's Judge Dredd pushed me to get my act together and finally post. Brothers of the Blood was the TPB collection that tipped me over the edge from a casual Dredd reader to a major fan. Since a lot of my love for it springs from the way it builds on decades of past continuity, I thought I'd collect some scans from earlier stories for context. Then I figured what the hell, collected the follow-up stories too, and the whole thing snowballed into an epic three part history of Dredd's relationship with his family of clones. In part two: two more clones join the family Dredd, and Vienna returns. Yep, three hundred monthly issues, twenty-five years of what can be called a niche product. Pretty amazing, actually. By the by, if anyone has handy scans of the America storyline, that'd be interesting to see. Also in this issue: "Lilly MacKenzie and the Mines of Charybdis", another of those hellworld stories the 2000 AD crew love so well--this one is an exposition chapter, with the action to start in #301. "Hondo City Justice": Like Judge Dredd, but in Japan. In addition to the killer schoolgirls in mini-skirts, there's a James Bond shoutout in the first couple of pages. "Anderson: PSI Division: The House of Vyle": The popular Psi-Judge investigates weird goings-on in old Salem. And a bunch of cool articles. Oh, and it's a good thing I ordered this for my pull list--the FLCS was going to cancel it because nb one bought these things for the last few months. Current Music: Gunsmoke: "Juniper Tree"
One of the innovative steps Pat Mills took when helping create 2000 AD (also including hiring the Mighty Tharg as editor) was fixing the standard chapter length of stories at six pages. While this meant fewer serials per issue, it also allowed more space to tell stories than the standard three or four pagers favored by the traditional British weeklies. Check back a few pages to my Victor post to see the "wall of text" this induced in the more complicated stories. 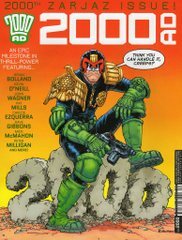 What this means for us at Scans Daily is that two pages of any given chapter of a 2000 AD story can be posted here. Still a bit choppy, I'm afraid, can't be helped. I'll just hope that the pages I've chosen from these five chapters are zarjaz for my first DW SD post. Some quick background on Judge Dredd for the three of you who are new here. In the dystopian future, a nuclear war and various ecological disasters have transformed the bulk of North America into a howling wilderness known as the Cursed Earth. Most of the remaining population is crammed into metroplexes called Mega-Cities. Mega-City One (formerly the East Coast) is a police state run by the Judges. The Judges were initially created as "super-cops" to deal with skyrocketing crime, but a series of disasters have left them as the only functioning government. Judge Dredd himself is the best of the lot, who has been described as "tough but fair." While he serves an oppressive system and enforces its harsh, nay, draconian laws, Dredd tries to do the right thing within those parameters. He's not a nice man by any measuring stick, but he's an excellent Judge. For more deep background, see Wikipedia or TV Tropes. Your thoughts? Want more Thrill-Power? Let me know!